Broomheads Estate Agency are the new leaders in the Bathroom Solutions Blackpool and Fylde Sunday Football Alliance after goals from Corey Harrison(3), Dax Hoogerwerf(2), Paul Simpson and Darren Heaney gave them a 7-0 win over 21st Century Windows. There was a brace each for Ash Robinson and Dean Richards in Additions’ 5-1 win over FC Shovels. Nathan Hine was also on target and Ross Jones replied. Danny Green fired a hat-trick as Blackhurst Budd put seven unanswered goals past Kingsfield. Ric Seear and Michael Clark got two each to complete the scoring. A Kyle Hendry brace and goals from Matt Nelson and David Warburton gave Exceptional Kitchens a 4-1 win to end Bloomfield Brewhouse’s 100 per cent start. Barry Davenport replied. Luke Robinson’s hat- trick set Appletree Finance on their way to a 5-3 win at Blackpool South, Josh Cole and Scott Anderson also scored. Dillon Conlon(2) and Kyle Magee replied for the hosts. Brad Gill scored four, with Jordan Smith(2), Danny Morris, Mason May and Will Robinson also on target as nine-goal Saddle picked up their first win at FC Rangers. Division one leaders Station Lytham had to work hard to stay top fter Ma Kellys Showboat gave them a hard game. Station won 5-3 thanks to goals from Ben McKay, AJ Greenwood, Harry Greenwood, Keith Hulme and Danny Jones. Michael Rose, Chirsty Donnelly and Jordan Bullen replied. E and P Publications are hot on their heels after they won 8-0 at Layton Pub thanks to four Sam Dyer goals and strikes from David Calvert, Andrew Duckworth, Robert Pye and Ahern Playforth. New Albert’s third win in a row was a close 2-1 success over Highfield Social. Scott Salanki scored both and Matty Askin replied. Wesham and BES Utlities played out a 10-goal draw with a brace each for Ric Tomlinson and Dwayne Greenwood for Wesham. Carl Duffy also scored for them while Lee Grundy hit a hat-trick in reply. Chris Evans and Ben Gibson also scored for BES. Aran Cooper and Tom Docherty gave Anchorsholme a 2-1 win over AFC Jewsons Blackpool (Chris Long). Division two leaders McNaughtons got back to winning ways 4-2 against Kirkham Town. Nathan Kerley, Joe Caton, David Ireland and Simon Annetts scored the goals, Tony Chapman and Rian MacDonald replying. Ben Roxby(2), Gavin Martin, Robert Hanslip and Andrew Kozlowski kept Clifton Rangers’ perfect record intact with a 5-3 win over Highlands.Daniel Dean(2) and Tom Harrison replied. Kieran Hindle’s goal secured King Edward’s first points and cost Boars Head their perfect start. Thomas Whittaker grabbed a hat-trick as Westview beat Wrea Green 6-2, Steven Rankine grabbed a brace and Kyrone Edwards the other, Josh Williams and Jackson Ashworth replied. 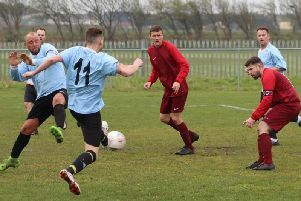 Blackpool Wren Rovers were beaten by West Lancashire League rivals Euxton Villa for the second week running. Seven days after knocking Wrens out of the Richardson Cup at the first hurdle, Villa also ended their unbeaten start to the premeir division campaign. Ben Seear gave hosts Wrens the lead early in the second half but Villa were level within two minutes and George Davies netted their winner after 68. Rovers are three points clear of Longridge Town at the top but have played two more than the champions, while Euxton are up to third. Fourth-placed Garstang were in Lancashire Amateur Shield action, Ryan Dodd scoring their only goal to settle the first-round tie at home to Wythenshawe Amateurs. Wyre Villa lost 3-2 at Atherton Town. Lancashsire Amateur Shield first round: Stoneclough v Poulton, Tempest U v Lytham Town. Anchorsholme FC were impressive 4-0 winners over Walmer Bridge, their third successive victory in Mid-Lancashire League division one. Anchors scored twice in each half, with man of the match Callum Greenall and Corey Harrison on target in the first half. Darren Heaney volleyed home from 25 yards midway through the second half and Luke Robinson made it four. Anchors have overtaken Walmer and stand third in the table going into the Lancashire Cup weekend.